Hello, world. It's been awhile, almost a week to be exact. ﻿I've been taking a little break from blogging due to the various baking blunders I've encountered the past week or so. I figured I needed to regroup a little. But I can never stay away for long because I really and truly enjoy doing this. "This" meaning cooking, baking, and writing about it. You could even say that I've found my niche. Or at the very least, my new favorite hobby. Among the many failed recipes I tried out last week, came one shiny beacon of hope in the kitchen. You must know how much I love cookie dough by now. If not, I'll tell you again. I LOVE cookie dough, so much so, that when I discovered how to easily make it egg-free,( for the cookie dough topped brownies) I started making it all the time just to have on hand in case I wanted some. And as much fun as it's been to eat cookie dough straight from the bowl and on a spoon, I've found a more effective and tasty way to enjoy the stuff. 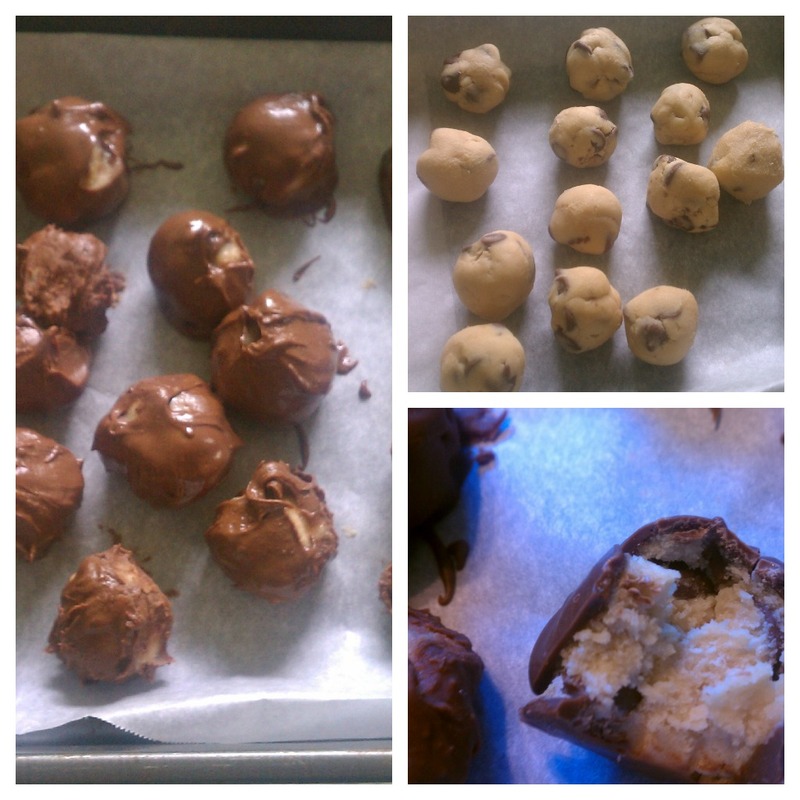 Cookie dough dipped in chocolate to make truffles. Enough said. In a large mixing bowl, beat together the sugar and butter until creamed. Add in the flour and mix until a dough begins to form, then add in the vanilla and milk and mix well. Stir in 3/4 cup of the chocolate chips with a wooden spoon. Refrigerate dough for about 1 hr before forming truffles. Line a 13x9 inch pan with parchment paper. 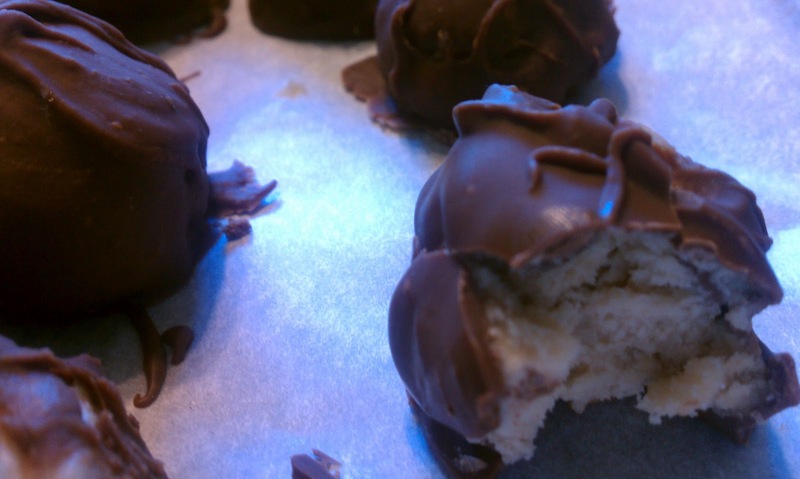 Use a spoon to scoop out 1 inch round cookie dough balls and place them on the baking pan. Cover with plastic wrap and place the baking pan in the freezer for about 30 minutes. Melt 1 cup of the semisweet chocolate chips in a medium sized microwave-safe bowl in the microwave on medium-power until it is all fully melted and smooth. Use two spoons to dip the cookie dough balls in the chocolate until fully coated, then let the excess chocolate drip back into the bowl. Repeat until all the cookie dough balls have been dipped. Note: If melted chocolate begins to harden in the dipping bowl, microwave again on medium until it is melted and smooth. Refrigerate until ready to eat, and to let the chocolate harden. Makes about 22 truffles.